There are currently 10 known Elite Battle Pets, as detailed on Wowhead. 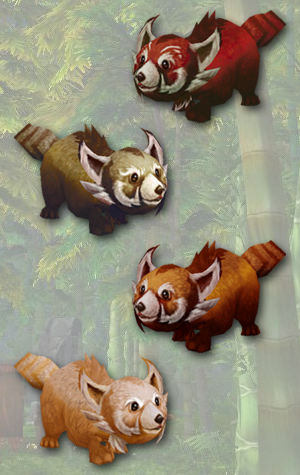 These specially marked opponents are requirements for the quest Beasts of Fable, which rewards the Red Panda! But that's not all. Completing this quest will earn you the achievement Fabled Pandaren Tamer, and unlocks the Beasts of Fable daily quest. Three additional uniquely colored panda pets (pictured right) have a chance to drop from the Fabled Pandaren Pet Supplies. If you think the Red Panda is a must have companion, you'll definitely want to complete the Beasts of Fable daily quest...on a daily basis! These named pets are marked with a notable orange paw print, making them stand out from standard wild pets. You won't have to search far and wide for them, though, since they remain stationary in a specific spawn location. Currently they have been found only in Pandaria, with one or two in each zone. In an Elite Battle, there is only one pet that you must defeat, but each fearsome foe is legendary quality and can range between level 23 and 25. This could make for a tough encounter! Here are some additional details about a battle with one of these pets. You cannot capture an Elite Battle Pet. Forfeiting or losing the battle will not cause the Elite Pet to despawn. Elite Pets despawning on the PTR is currently a bug. These pets cannot be attacked or killed using player spells and abilities. So continue to train hard with your pet team — when 5.2 comes, you'll have some serious opponents to face!